One of the beautiful things about our Church—the Church of Jesus Christ of Latter-day Saints–is our belief in revelation. The principle of receiving guidance directly from a heavenly source brings me so much peace. Even when trials abound, I still have hope that God is at the helm and will not let me sink. When we keep these covenants, God promises to give us His Spirit to always be with us. This is pretty incredible when you stop to ponder what that really means. When we live worthy, we have access to a member of the Godhead to ALWAYS be with us. That means every decision we make, the Holy Spirit can guide, help, assure, encourage, warn, or otherwise lead us to make correct and wise choices…or avoid choices that can hurt us. I treasure this gift. There are so many crazy decisions and choices to make. Some are little—like what clothes to wear. Other decisions have lasting (even eternal) impact. It’s nice to know that if I ask and seek guidance through prayer, scripture study, and quiet pondering, I can receive personal revelation from God through the Holy Ghost. That is powerful doctrine…and it’s true. Young adults have to make choices about friends, goals, hobbies, who they will date, how much education to attain. They have to figure out whether they’ll go away to school or stay home. There are decisions of marriage, career, family, and how to make a mark on the world for good. The Holy Ghost can help us make all these big decisions, and feel peace that we are doing what God wants us to do. There are things we can do—and NOT do—to enable the Holy Ghost to speak to us more clearly. Negative emotions (anger, hurt, defensiveness, jealousy, bitterness, pride). These hinder us from hearing the Spirit’s still, small voice. He will not force God’s will on us by competing with noisy, negative feelings. He will never yell…so if we find ourselves doing so, we are drowning Him out. Crude humor/inappropriate joking. The Holy Ghost will not stand by and watch us make fools of ourselves as we demean others and ourselves with crude words or gossip. Exaggeration/loud speech/gossip. The Holy Ghost testifies of truth. He will not abide belittling or hurtful speech of any kind. Distractions/Busy schedules. When we get too busy and stressed out, it can be hard (or impossible) to hear the Holy Ghost’s small, gentle voice. Work to simplify and prioritize so quiet time is part of your day—time to listen for that still, small voice. Pride/judgmental attitude/unkindness/selfishness. These will not allow God to reveal Himself to us. He will leave us to ourselves…since that is all we are thinking of. These are FRIENDS & invite the Holy Ghost into our lives. Prayer/Pondering – When I take time to ponder my choices and desires, the Holy Ghost whispers what I should do—or not do—during my prayers, or later as I reflect. Scripture Study – Add this onto prayer & pondering and you have fertile ground for the Holy Ghost to plant seeds of faith and testimony in your heart. Fast with a purpose – especially for big or difficult decisions. When we humble ourselves and sacrifice food for two meals, we move into a more teachable state where the Holy Ghost can speak more clearly to our minds and hearts. Humility – pride will drive away the Holy Ghost faster than any other trait. Humility is pride’s opposite and will bring us closer to the Spirit faster than any other action. Humility is not weakness. It is spiritual strength in action. Careful, quiet speech – just as loud, obnoxious, hurtful speech will drive the Spirit away, careful, quiet speech will allow Him to be our Constant companion. Healthy lifestyle (exercise, sleep, good eating habits) – Our bodies and spirits are connected. If we don’t treat our bodies right, our spirit suffers. When I’m exercising and trying to be healthy, I have a happier temperament and am more energetic. More energy and happiness mean I’m capable of reaching out to do more good in the world. If I’m feeling sluggish or weak, my spiritual life slips into sloth-mode as well. Recording our feelings – When we receive inspiration, writing it down helps us remember it. During tough times, it is edifying to read through journals and remember the times God has helped and provided miracles in the past. As we record these sacred experiences, we show God that we treasure His revelation…and He will send more. Mental & Physical Purity – God cannot dwell in unclean tabernacles. We need to do all we can to keep ourselves unspotted from the world—not pick up bad habits, addictions, or other vices that bind us and keep us from partaking of God’s bounteous blessings. Service – The Holy Ghost works best when we’re concerned about others—wanting to help our fellowmen and ease their burdens. We will receive revelation for whom we should help, even people we don’t know need it (but God knows). I am grateful to be a member of God’s true Church on this earth, and am especially grateful to be able to receive personal revelation if I keep my covenants I made at baptism. I’m grateful for a living prophet who guides God’s Church today, receiving revelation for His Church as a whole, and giving us warning and direction in this wicked world to help us be safe and happy. I bear my testimony that God’s prophets receive revelation today…just as Moses, Noah, and Elijah did in their day for their people. And we can receive personal revelation of our own. God has not left us to wander in this crazy world alone. He is willing and anxious to give each and every one of us direction in our lives. All He requires is that we are repent, be baptized, and covenant with Him to do those three things I listed at the beginning (take His name upon us, always remember Him, and keep His commandments). In return, He promises that we will ALWAYS have the Spirit to be with us. How great is that! It’s marvelous and glorious! I hope you will partake of this mighty and powerful gift God wants you to have in your life if you haven’t already. Come unto Him. Repent. Be baptized. And receive the Holy Ghost to be your constant companion. That is the doctrine of Christ…and it brings me much joy. Charissa, I love this truth. You laid it out in a remarkable, beautiful and clear manner. This is exactly what we were talking about in my family home evening last night. It was precious to hear the many examples my grandchildren shared. It touched my heart to hear of when they prayed and followed the direction they sensed. That is my deepest desire…..that each of my family members recognize and practice using this gift. 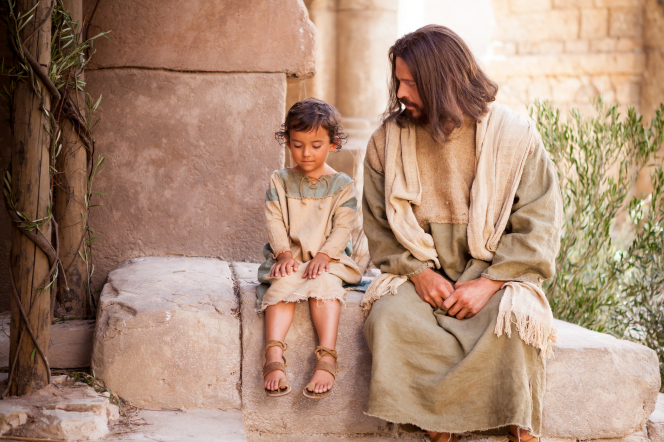 Thank you for reminding us of this sweetest of gifts from our Father who loves each of us. I love that you are teaching this to your grandchildren as well. True joy and happiness come from following God’s will, and we can know what He wants us to do if we simply ask and listen for His answer.